So, I sit here shaking and on the brink of tears. I can’t tell you why I’m so afraid. I can’t tell you what will happen in ten minutes. I can’t tell anyone what this feels like. Not really, because there’s no way for me to know. From a scientific position, this is a really interesting thing to experience. I don’t know if you have ever had a major bone break, or had a really bad cut. But there’s this feeling that I can only remember having when I broke my collar bone. The feeling of ultimate dread. That’s the part of pain that narcotics treat. That dread feeling. You still feel the pain, but you don’t feel the dread. You don’t feel like the world is ending. I have the opposite today. I feel the dread, but no pain. I feel like the world is ending, and there’s nothing I can do about it. I feel like everything I love is going to die. I don’t know if it will be blessedly fast, or tortuously slow. All I know is that there’s nothing I can do to stop feeling this way. I shake, and I can’t stop torturing myself with images of the beautiful things that are going to be lost. Baby’s Breath, that little white flower they stuff in around huge blossoms like roses. Children on the playground. Giggles. Puppies. Ballroom dancing. It’s so painful, so why can’t I just stop? I have what’s called a Mixed Episode. 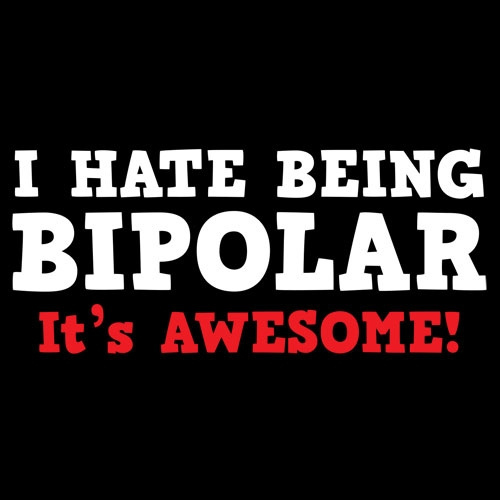 It’s a special symptom of Bipolar Disorder where I feel both Manic and Depressed at the same time. It’s HELL. I shake, I rub my skin until I have scabs form on my arms.. without scratching or bleeding.. just chaffed to a point where my body can’t handle it anymore. I feel like an insect, and like a pipe bomb all at once. I feel like there’s no way I can matter, and like the whole world hinges around me all at the same time. I am so worthless, but so significant. I shake. I can’t stop my hands from moving across my body. I thank God I don’t have the urge to hurt myself anymore. I don’t know how I would stop myself from doing something drastic. But I don’t. I refuse to preoccupy my thoughts that way. Instead I torture myself, feeling like nothing I do has significance, but knowing I have to keep doing other things, so that when I feel normal again, I don’t have to spend weeks making up for the few shallow mistakes I might make while in this state. I shake. I face the day. I pray. I hope I don’t worry you. I will be okay. I love you all. This entry was posted in Bipolar, Death, Depression, Paranoia, PTSD and tagged Anxiety, Daily Update, Death, Depression, PTSD on March 8, 2013 by Rory.